Polytechnics are adding new facilities and upgrading existing ones in the next one to two years to cope with a rising intake. These include aerospace hubs and operating theatres where students can learn in industry-standard environments. Over the years, students have been drawn to the polytechnics' various niche courses and applied learning approach. A spokesman for the Ministry of Education (MOE) said it has increased its investments in education "significantly over the past decade", including upgrading and building new polytechnic teaching and learning facilities. Singapore Polytechnic's perfumery and cosmetic science centre and Temasek Polytechnic's 6,000 sq m aerospace hangar, for instance, were completed last year. Singapore's five polytechnics took in 24,200 students this year. In the past few years, they accepted 25,000 to 26,000 students a year, up from 20,000 to 22,000 a decade ago. MOE had previously said that 45 per cent of each Primary 1 cohort will make it to a polytechnic this year, up from 43 per cent in 2012. Responding to questions, the ministry said about 49 per cent of the Primary 1 cohort was admitted to publicly-funded full-time diploma programmes last year. This included polytechnic students and others at Lasalle College of the Arts and Nanyang Academy of Fine Arts. Separate figures on the polytechnics were not available as the ministry had changed its method of calculation last year. Polytechnic officials said the expansion of industry-standard facilities was to help students be more prepared for work. This year, Ngee Ann Polytechnic added four new labs - an operating theatre suite, two training labs and a nursing room. They have computerised mannequins that simulate heart attacks, for example. Nursing student Mohamed Farouq, 18, said: "Being in these scenarios helps us understand theories better and practise our skills." From next month, Mr Clarant Lourdesamy, 18, a second-year hotel and hospitality management student at Republic Polytechnic, will get to use six labs modelled after hotel rooms, up from three now. 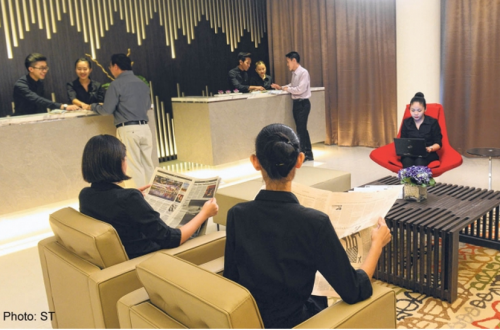 Students practise housekeeping skills in different types of rooms found at resorts, and business and boutique hotels. "We'll have 30 to 45 minutes each week of individual practice in housekeeping and front reception. Now we get about 15 minutes," he said. "The lecturers role-play as guests to train our front desk skills and the rooms are very realistic. It helps me to understand the hotel industry better." A media hub will be ready this year for mass media management students. It will be modelled after print and broadcast production studios. A training space for business management students to learn about merchandising, visual display of consumer items and retail app technologies. It will be launched in June. An aerospace hub with a 450 sq m hangar for engineering students. It will be ready in October. A new Republic Polytechnic Industry Centre, most of which will be completed by July. It will house facilities such as an engineering design studio, hotel rooms and reception areas, a food-processing lab, and a logistics warehouse. A new four-storey Aerohub will be ready this year. All of SP's planes - the Cessna 310, Cessna 172, A4SU Super Skyhawk and the UH1H Huey Helicopter - will be housed there. There will also be a wind tunnel lab and a research and development centre. A four-storey Veterinary and Aquaculture Centre will be ready in the third quarter of this year. It will house teaching and research facilities, including an animal wellness centre and clinic.